Have you ever downloaded a program and it didn’t turn out to be what you thought? Or you came across an old program that you don’t use anymore and you want to clean it off of your hard drive? Removing these programs is a simple enough process, but what most people don’t realize is that after the program is deleted, old files and registry entries are left behind on your PC. These invalid registry entries and junk files can lead to system malfunction and eventual failure. But you don’t have to worry when you have Easy Uninstall Pro. This unique software program works with your computer to easily remove old programs and all associated files and registries. Easy Uninstall Pro scans your hard drive while removing a selected program and identifies any files that would be leftover by using the normal uninstall method. Without Easy Uninstall Pro, your computer is at risk of crashing and freezing up because of old, left-behind files. It would take hours of manual searching and deleting to find and thoroughly clean this information from your system. So why would you let your investment slowly die? Maintenance and upkeep is important in keeping your computer system healthy and working properly. Without Easy Uninstall Pro, your PC may fall victim to corrupt files and registry entries over time. 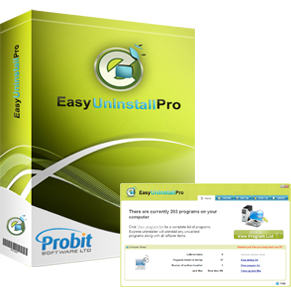 Visit Easy Uninstall Pro website!